Use the MD Trader - Advanced window to invert the price column and enable and define the User-Defined Price (UDP) column. When enabled, this column appears to the left of the standard price column and can be set to show the Net Change, Price As Yield, Yield-To-Maturity, or Par Rate (Eris Exchange only) for a given contract. 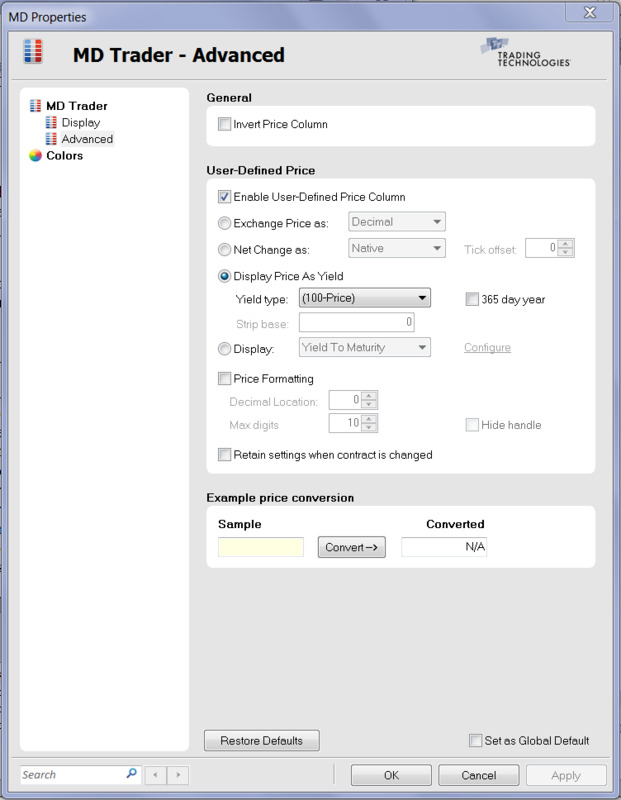 To create a UDP column in Autospreader, refer to Trading in Yield in the Autospreader Help. Note: When accessed via the context menu, the Set as Global Default checkbox at the bottom of the tab applies these properties to all subsequently opened MD Trader windows. The Invert price column checkbox lets you invert the entire MD Trader price column, placing the low price at the top and the high price on the bottom. Additionally, your Buy orders will be on top of the chart, and your Sell orders will be on the bottom. This property does not affect the direction of prices displayed in attached Time and Sales. Lets you create and define a new price column. The Exchange Price radio button lets you further customize a user-defined price column, which appears next to the normal MD Trader price column. A user-defined price column lets you display the contract price in a way that appeals to you. 1 / Price: Displays the price as a decimal value 1 divided by the decimal equivalent of the price. The Price formatting section further customizes the price. Decimal: Displays the native prices formatted as their decimal equivalent. Ticks: Displays each price as the equivalent number of ticks from the inside market. Note: This property will create a user-defined price column that is in ascending order, rather than descending order. You can use the Invert Price column setting to flip MD Trader so this column appears in descending order. Displays the price of the contract minus the settlement price. Display Type: Defines how the price is formatted. ((100000-Price)/1000): 30 Day Fed Fund. The yield is calculated by subtracting the instrument price from 100000 and dividing the result by 1000. No Conversion: The instrument price is in yield. Conversion not necessary. Yield-To-Maturity: Displays price based on the rate of return if held until the maturity date. An algorithm calculates the price accurate to six decimal places. Note: When you are trading BrokerTec products, the coupon rate, maturity date, and settlement date are provided for you as of BrokerTec Gateway 7.13. Custom pricing model: A pricing model you created and activated. For more information, refer to the Autospreader Help. Par Rate: Converts the net present value (NPV) price of an Eris Invoice Spread to an equivalent Par Rate (yield). Select Configure for all other fields, which are required unless otherwise noted. Annual interest rate (as a decimal). Must be greater than 0.1 and less than 100.00 and accurate to 4 digits. This field is available when Display is set to “Yield To Maturity” or “Par Rate”. The date of the bond. Must be greater than the settlement date and greater than today. (Not required): The factor by which the futures price will be multiplied if the specified bond is delivered against it. Must be greater than 0.1 and less than 5.0 and accurate to 4 digits. The date the contract settles. Must be less than the maturity date and greater than today. 360: The year has 360 days. Determines whether coupon payments always occur on the last day of the month if the settlement date falls on the last day of the month. The following settings must be specified if the bond has an odd first coupon period and the settlement date falls within this odd first coupon period. PV01 Sets the PV01 value used to convert the quoted NPV value of an Eris Invoice Spread contract to its corresponding par rate. The PV01 is calculated, first, then entered in this field to display Eris NPV prices in terms of Par Rate in the MD Trader price ladder. This field is only available in MD Trader when Display is set to “Par Rate”. Customizes the price format. Watch the Converted price field to see how your changes affect the price. Decimal location: Moves the decimal place one spot to the left or right, depending on the price. Max digits: Determines the maximum number of digits to show. Hide handle: Hides the whole number in front of the decimal. Retains new price column settings when you drag a new contract onto this window. Lets you view the converted price based on the parameters that you select above. For this to work, you must first open MD Trader with a contract.